Sometimes a lump is just a lump. Last spring I spotted a lump on the overhanging branch of a tree near our back porch. I hopefully wished the lump might be a hummingbird nest, since I had seen one a friend had found, a finely constructed hollow cushion of lichen and spiderweb silk, which had fallen onto the ground. The porch is where a much-visited hummingbird feeder hangs. I kept my eye on the lump as long as I could with a pair of bird-watching glasses, but eventually the oak leaves emerged and obscured it. I tried to learn more about the nesting habits of hummingbirds, and read that nests may be used for more than one season by returning hummingbirds, if still habitable. The hummingbirds returned in late April. Throughout the day, they visit the feeder and perch in a nearby holly. They are ardent visitors of the gaura and fuchsia in terrace containers and phlox in the border, but I have not been able to follow their route to the nest locations. I finally realized my wish to see a functional nest when the owners of a garden where we work spotted one in use, right off their deck. The occupant, a territorial battle-axe in miniature, had revealed her location by repeatedly emerging to dive-bomb three robins innocently hunting for earthworms on the lawn below. Her nest was not a lump! It was a mere subtle swelling on the branch that held it, and would never have been noticed without her active belligerence. So while whatever I was staring at intently through the binoculars is probably a gall or growth of some sort, now I doubt it is a hummingbird nest. The quest continues. As fall approaches and daylight diminishes, chickens receive the signal to molt, the annual shedding of their old feathers and growing in of new ones. The process of growing new feathers requires a serious output of energy on the part of the bird; consequently, egg laying may taper off. 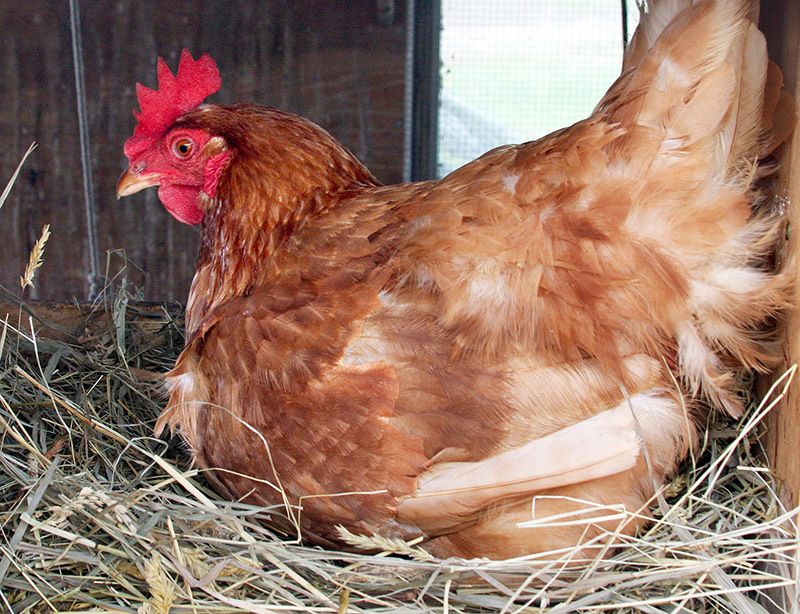 According to “Backyard Chickens: Beyond the Basics” (Pam Freeman, Voyageur Press), poultry breeders breed for the “hard” molt, an all-at-once molt where the hen sheds her feathers relatively rapidly and early in the season, as opposed to the “soft molt,” a prolonged, intermittent loss of feathers. Hard molt signifies a favorable laying timetable that returns the bird to production in the shortest time, but other factors influence the process, such as age of the bird, diet, and time of year. The feathers of a bird are composed of a high percentage of protein (keratin), and growing new ones creates nutritional stress for her. Many chicken keepers recommend a change in feed while this nonlaying phase is taking place, using a higher-protein, grower-type feed formulated for young birds, or black oil sunflower seed. If you have them, sour milk, cheese rinds, and high-protein table scraps are also good. Meanwhile, the henhouse may be ankle-deep in molted feathers, along with bedding accumulated since the last clean-out. Too bad there is no convenient backyard way to shred and chop feathers: feather meal is an ingredient in several top-of-the-line organic soil foods, but some models of leaf shredder may work with feathers. However, I promote the view that all biological matter generated on your property ought to stay on it; even the eggshells are dried (do not nest them, they will never dry), crushed to powder, and added back into garden soil. Chickens are a key component in backyard fertility and composting; these accumulations are valuable for increasing fertility and tilth of soils. Pile it on. Use the henhouse accumulations mentioned above if you have them, to prep the bed for seed garlic, to be planted a little later, between October and December. With the urge to set seed acting strongly in plants now, deadheading can be a time-consuming process. Watch buddleia, snapdragons, and phlox especially, which go from full panicle to full seedhead overnight. Reblooming daylilies, such as ‘Happy Returns,’ try to ripen seedpods and slow their forming of new bloom stalks. When passing tropical disturbances dump a good rainfall here, many flowering perennials, even shrubs, push out fresh growth. The growth rate of vines this season has been astounding. Porcelain berry, honeysuckle, Virginia creeper, Boston and English ivy, bittersweet — you name it, if it is a vine, this year it has become a “mile-a-minute” vine. Liquid feeds for crops such as broccoli and cucumbers help to maintain vigor during the dog days. Comfrey, manure, liquid seaweed, and fish are all good ones, and may be applied through the sprayer along with Bt for caterpillar control. 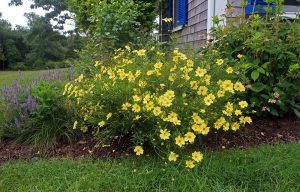 We Chelsea-chopped coreopsis ‘Full Moon’ earlier in the season to prevent floppiness and minimize staking, but then found the pinched plants slow to regrow and bloom. 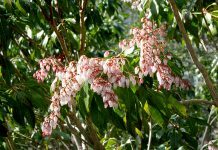 (They should, however, flower well into fall.) Cosmos ‘Sonata’ Series grew poorly, almost from time of planting onwards. Proven Winners hybrid heliopsis ‘Tuscan Sun’ seems to revert from the desirable compact form to a tall, ungainly plant that is inferior to ordinary heliopsis. Deer nibbled “dinner plate”-type hybrid hibiscus this year; they normally avoid it. Cleome ‘Senorita Rosalita’ and ‘Senorita Blanca’ have demonstrated great garden presence and heat tolerance. Tomato ‘Black Krim’ is long on flavor, but cat-faced more readily than other tomatoes we grew. The fall plant sale preview and sale take place Sept. 7 and 9. 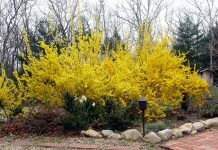 The 5:30 pm Sept. 7 preview is an illustrated talk by Tim Boland, describing distinctive plants that will be on sale at the Arboretum nursery on Sept. 9. Also on Sept. 9, at 1 pm, Rebecca Lindenmeyr will give a talk, “Creating Pollinator Gardens and Habitat Hedgerows.” All are free and open to the public. Next articleThanks for the Chappy parking!